One of the reasons that concurred to the South American approach to European countries regarding the weapons acquisition was dictated by price and conditions of payment. The principal issue is the relation between Brazil and Germany, developed with the purchase of pieces and Artillery accessories from German Krupp from March 1938 until the beginning of 1942. Moreover an analysys in depth at the military documents made by the Artillery Col. Anôr Teixeira dos Santos in the second semester of 1940, when the same was designated to head the Brazilian Military Commission at Essen, Germany, with the primary goal of observation and purchase of weaponry. On 8 Sep 1940, the group departed to Berlin in order to report to the Brazilian embassy, when already on the 25th they arrived at Meppen with the purpose of watching German artillery exercises as well as for the delivery of the first batch of 75 mm guns.On 10 Oct, the group went to Weimar to pay a visit to the Gustloff-Werke factory and on 4 Nov Frankfurt was the following destination for another visit to Matra-Werke house and to watch and delivery of more equipment. Already on 11 Nov they moved to Kassel for a visit to Henschel-Werke and from 26 to 31 Dec 1940 the group remained in Munich visiting the facilities of Krauss & Maffei. On the first day of January 1941 the Brazilian authorities went to Berlin having the visit lasted until the 6th when the group visited the Siemens- Schukert complex and at the same time dealing with the Commission documentation at the Brazilian Embassy. On 31 Jan, the group departed to Gelsenkirchen to the delivery ceremony of more combat equipment and ammunition transport car for the recently acquired 75 mm guns, having returned to Meppen on 21 Apr, to watch a firing exercise with the prototype of the new 105 mm howitzer and the 105 mm field gun. On 11 Aug, the Commission drove to Meppen this time to watch exercises with 150 mm howitzers. When the news came on 29 Jan 42 through the Brazilian embassy of the breaking of diplomatic relations between the two countries, the Brazilian Military Commission in Essen ended the task and all papers and documents were ordered to be put in crates that were kept in custody at Krupp house. As it can be seen the vigorous trading relation between Brazil and Germany was well developed in the mid of the war, and only upon the breaking of relations the Commission returned to Brazil. Some other factors favored a closer relation with Brazil and Germany. In May 1938 Brazilian authorities were informed that Argentina the greatest Brazilian rival in the continent had in view of purchasing a vast array of armaments in Europe. This fact was added by one disquieting military report that fuel stocks at disposal of the Armed forces were in their lowest levels, giving a mere eight day of combat effectiveness in case of an open conflict with other nation. That alarming reality, had no other consequence but to stiffen the determination of Brazilian Government to re equip and update the Armed Forces. Brazilian members seen greeted by German honor guard at Henschel plant at Schonefeld. One Brazilian staff member and a German pilot share impressions after a flight in front of one Naval aircraft Henschel Hs 126. Technical details are given to one Brazilian pilot at the cockpit of one Stuka dive bomber Ju 87. The Brazilian Commission seen during a demonstration of a Junkers aircraft.They raise their heads to watch one flight demonstration. Brazilian delegation seen when welcomed by German authorities at Messerschmitt on Feb. 1st 1939. The Luftwaffe band is seen at right. Brazilian and German authorities seen during lunch with legendary Willy Messerschmitt. Brazilian authorities seen in front of Siemens & Halske on February 1939. Brazilian authorities at the ramp of Arado aircraft plant. In the bottom one aircraft Ar 95 is ready to fly. Brazilian authorities seen at BMW engine plant. Germans and Brazilians seen gathered with Ernst Heinkel in one of the several meetings involving military authorities of both countries. In the picture, the members of Brazilian mission upon their arrival at Hamburg. Among them The political, economic and military approach of Brazil and Germany aroused suspicions in the Roosevelt Administration that Brazil could align itself with the Nazi regime. Brazilian and German pilot talk in front of one Bucker training aircraft. 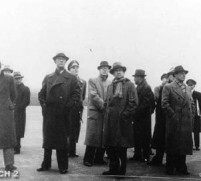 Brazilian and German authorities seen during visit on Feb 1939 at Bucker plant.